I don’t think I’m going out on a limb saying that our conference last week was a success. Thanks to everyone who attended and thanks again to all the speakers. Muthu actually beat us to it and wrote up a nice summary. Very kind words from a great guy. For those of you that couldn’t make it (or those that want to relive the fun) we posted the videos and slides. Thanks again to everyone for making it such a success! We, along with our friends at Foundation Capital, are pleased to announce a 1 day mini-conference on streaming and sketching algorithms in Big Data. We have gathered an amazing group of speakers from academia and industry to give talks. If you are a reader of this blog we would love to have you come! The conference will be on 6/20 (Thursday) from 10 AM to 5:30 PM at the 111 Minna Gallery in San Francisco and attendance is limited. Breakfast and lunch included! There will also be a happy hour afterwards if you cannot make the conference or just want a beer. The Count-Min Sketch is a data structure for indexing data streams in very small space. In a decade since its introduction, it has found many uses in theory and practice, with data streaming systems and beyond. This talk will survey the developments. Muthu Muthukrishnan is a Professor at Rutgers University and a Research Scientist at Microsoft, India. His research interest is in development of data stream theory and systems, as well as online advertising systems. The talk will focus on how sketching techniques from the data stream literature can be used to speed up well-studied algorithms for problems occurring in numerical linear algebra, such as least squares regression and approximate singular value decomposition. It will also discuss how they can be used to achieve very efficient algorithms for variants of these problems, such as robust regression. David Woodruff joined the algorithms and complexity group at IBM Almaden in 2007 after completing his Ph.D. at MIT in theoretical computer science. His interests are in compressed sensing, communication, numerical linear algebra, sketching, and streaming. Summingbird is a platform for streaming map/reduce used at Twitter to build aggregations in real-time or on hadoop. When the programmer describes her job, that job can be run without change on Storm or Hadoop. Additionally, summingbird can manage merging realtime/online computations with offline batches so that small errors in real-time do not accumulate. Put another way, summingbird gives eventual consistency in a manner that is easy for the programmer to reason about. Sam Ritchie works on data analysis and infrastructure problems in Twitter’s Revenue engineering team. He is co-author of a number of open-source Scala and Clojure libraries, including Bijection, Algebird, Cascalog 2 and ElephantDB. He holds a bachelor’s degree in mechanical and aerospace engineering. Nearest Neighbor Search is an ubiquitous problem in analyzing massive datasets: its goal is to process a set of objects (such as images), so that later, one can find the object most similar to a given query object. I will survey the state-of-the-art for this problem, starting from the (Kanellakis-award winning) technique of Locality Sensitive Hashing, to its more modern relatives, and touch upon connection to the theory of sketching. Alexandr Andoni is a researcher in the Microsoft Research at Silicon Valley since 2010, after finishing his PhD in MIT’s theory group and year-long postdoctoral position at Princeton University. 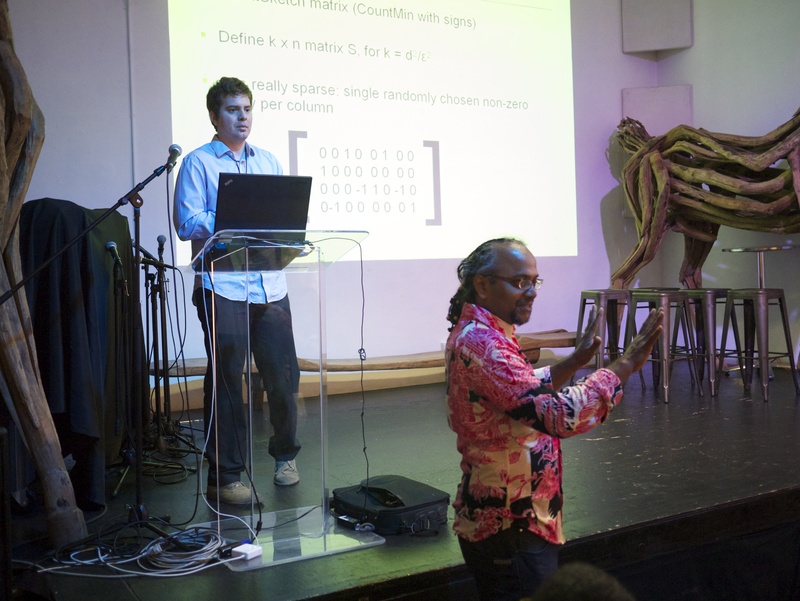 His research interests revolve around algorithms for massive datasets, including similarity search and streaming/sublinear algorithms, as well as theoretical machine learning. Pete Skomoroch from the LinkedIn data science team. Rob Grzywinski of Aggregate Knowledge. Update! We posted the videos and slides for those of you that couldn’t make it (or those that want to relive the fun). Enjoy! Before there was LogLog, SuperLogLog or HyperLogLog there was Probabilistic Counting with Stochastic Averaging (PCSA) from the seminal work “Probabilistic Counting Algorithms for Data Base Applications” (also known as the “FM Sketches” due to its two authors, Flajolet and Martin). The basis of PCSA matches that of the other Flajolet distinct value (DV) counters: hash values from a collection into binary strings, use patterns in those strings as indicators for the number of distinct values in that collection (bit-pattern observables), then use stochastic averaging to combine m trials into a better estimate. 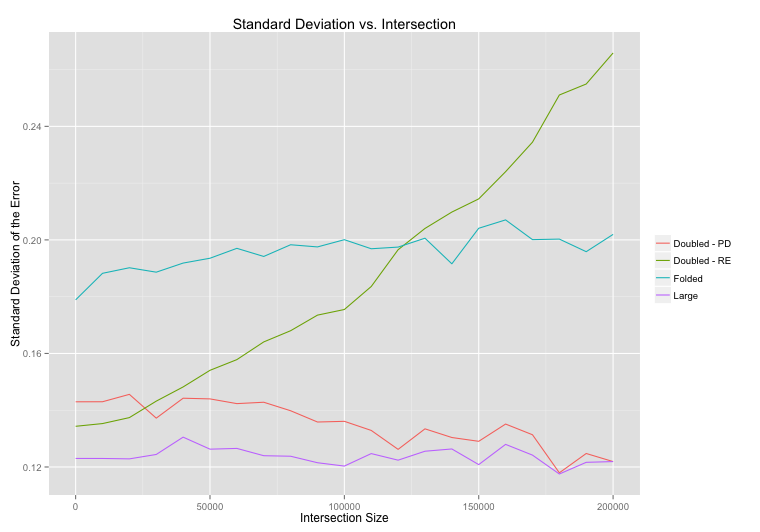 Our HyperLogLog post has more details on these estimators as well as stochastic averaging. 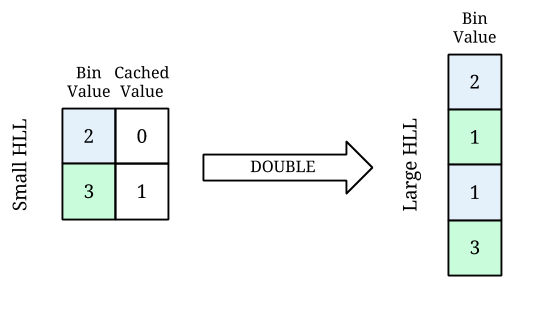 For each value added to the DV counter, a suitable hash is created and the position of the least-significant (right-most) 1 is determined. The corresponding position in a bitmap is updated and stored. I’ve created the simulation below so that you can get a feel for how this plays out. Run the simulation a few times and notice how the bitmap is filled in. In particular, notice that it doesn’t necessarily fill in from the right side to the left — there are gaps that exist for a time that eventually get filled in. As the cardinality increases there will be a block of 1s on the right (the high probability slots), a block of 0s on the left (the low probability slots) and a “fringe” (as Flajolet et al. called it) of 1s and 0s in the middle. I added a small pointer below the bitmap in the simulation to show how the cardinality corresponds to the expected bit position (based on the above probabilities). Notice what Flajolet et al. saw when they ran this same experiment: the least-significant (right-most) 0 is a pretty good estimator for the cardinality! In fact when you run multiple trials you see that this least-significant 0 for a given cardinality has a narrow distribution. When you combine the results with stochastic averaging it leads to a small relative error of and estimates the cardinality of the set quite well. You might have also observed that the most-significant (left-most) 1 can also be used for an estimator for the cardinality but it isn’t as clear-cut. This value is exactly the observable used in LogLog, SuperLogLog and HyperLogLog and does in fact lead to the larger relative error of (in the case of HLL). Stochastic averaging is accomplished via the arithmetic mean. You can see PCSA in action by clicking on the image below. There is one point to note about PCSA and small cardinalities: Flajolet et al. mention that there are “initial nonlinearities” in the algorithm which result in poor estimation at small cardinalities ( ) which can be dealt with by introducing corrections but they leave it as an exercise for the reader to determine what those corrections are. Scheuermann et al. did the leg work in “Near-Optimal Compression of Probabilistic Counting Sketches for Networking Applications” and came up with a small correction term (see equation 6). 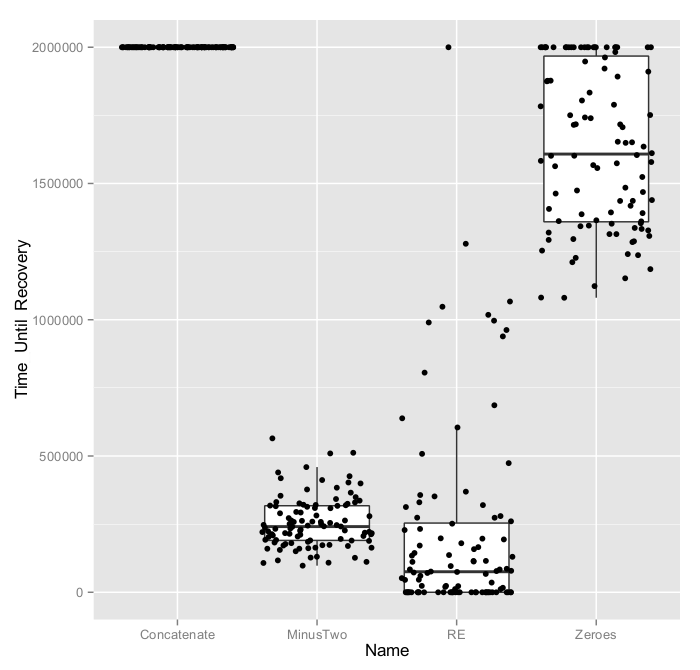 Another approach is to simply use the linear (ball-bin) counting introduced in the HLL paper. Just like HLL and KMV, unions are trivial to compute and lossless. The PCSA sketch is essentially a “marker” for runs of zeroes, so to perform a union you merely bit-wise OR the two sets of bitmaps together. Folding a PCSA down to a smaller m works the same way as HLL but instead of HLL’s max you bit-wise OR the bitmaps together. Unfortunately for intersections you have the same issue as HLL, you must perform them using the inclusion/exclusion principle. 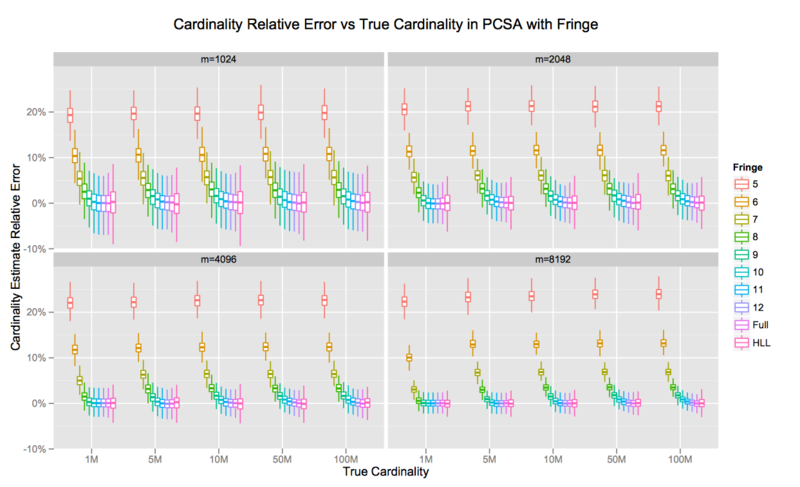 We haven’t done the plots on intersection errors for PCSA but you can imagine they are similar to HLL (and have the benefit of the better relative error ). A PCSA sketch with the same accuracy is 3.6 times larger than HLL! But what if you could make PCSA smaller by reducing the size of the bitmaps? Near the end of the paper in the Scrolling section, Flajolet et al. bring up the point that you can make the bitmaps take up less space. From the simulation you can observe that with a high probability there is a block of consecutive 1s on the right side of the bitmap and a block of consecutive 0s on the left side of the bitmap with a fringe in between. If one found the “global fringe” — that is the region defined by the left-most 1 and right-most 0 across all bitmaps — then only those bits need to be stored (along with an offset value). The authors theorized that a fringe width of 8 bits would be sufficient (though they fail to mention if there are any dependencies on the number of distinct values counted). We put this to the test. 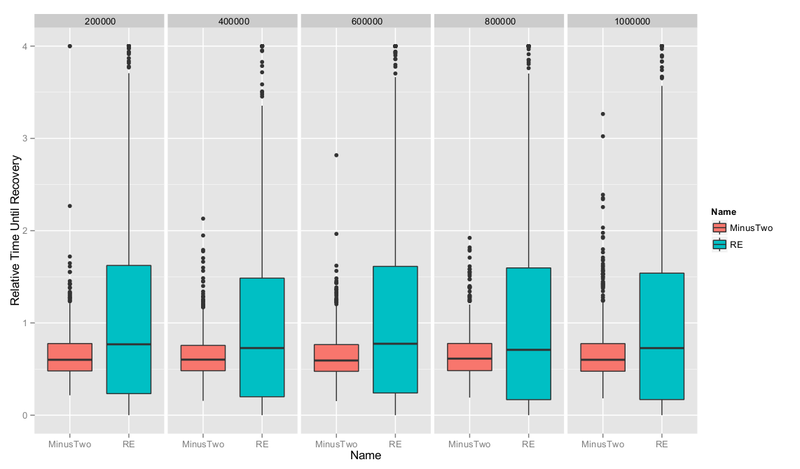 For a plot with larger m values, click here. This is getting much closer to HLL! The combination of tighter bounds on the estimate and the fact that the fringe isn’t really that wide in practice result in PCSA being very close to the size of the much lauded HLL. This got us thinking about further compression techniques for PCSA. After all, we only need to get the sketch about 1/3 smaller to be comparable in size to HLL. In a future post we will talk about what happens if you Huffman code the PCSA bitmaps and the tradeoffs you make when you do this. PCSA provides for all of the goodness of HLL: very fast updates making it suitable for real-time use, small footprint compared to the information that it provides, tunable accuracy and unions. 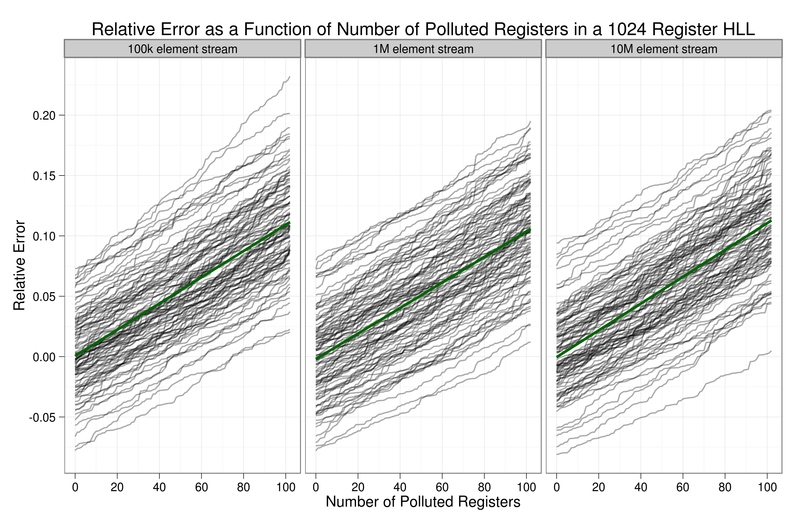 The fact that it has a much better relative error per register than HLL indicates that it should get more credit than it does. Unfortunately, each bitmap in PCSA requires more space than HLL and you still get less accuracy per bit. Look for a future post on how it is possible to use compression (e.g. Huffman encoding) to reduce the number of bits per bitmap, thus reducing the error per bit to match that of HLL, resulting in an approach that matches HLL in size but exceeds its precision! 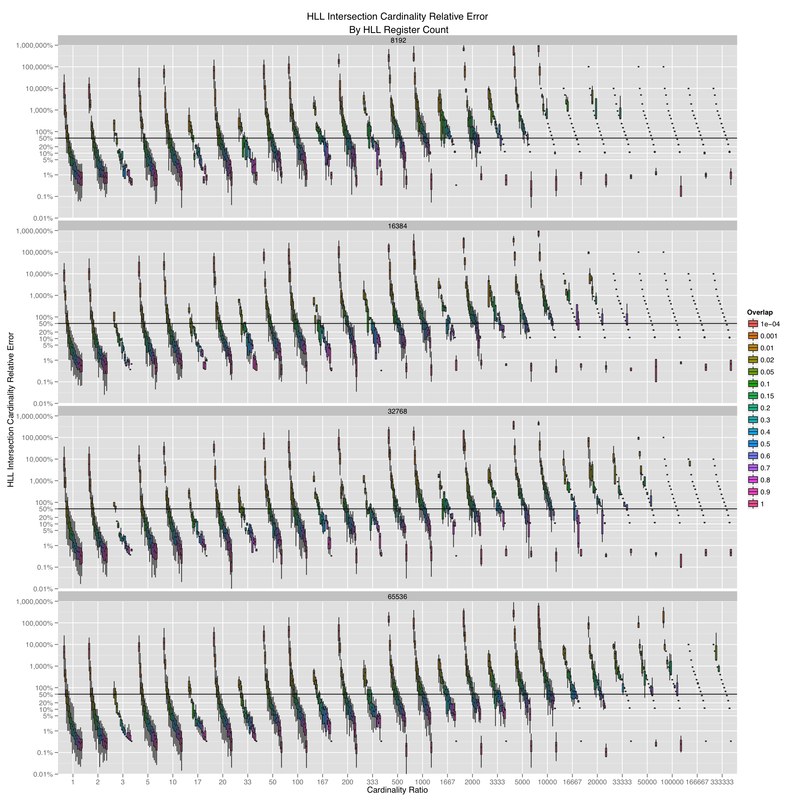 While we were putting this post together we discovered many interesting things to look at with respect to fringe optimization. One of the questions we wanted to answer was “How often does the limited size of the fringe muck up a bitmap?” Below is a plot that shows how often any given sketch had a truncation event (that affected the DV estimate) in the fringe of any one of its bitmaps for a given fringe width (i.e. some value could not be stored in the space available). Note that this is an upper bound on the error that could be generated by truncation. If you compare the number of runs that had a truncation event (almost all of the runs) with the error plot in the post it is quite shocking that the errors are as small as they are. There are likely a few ways to improve the fringe truncation. 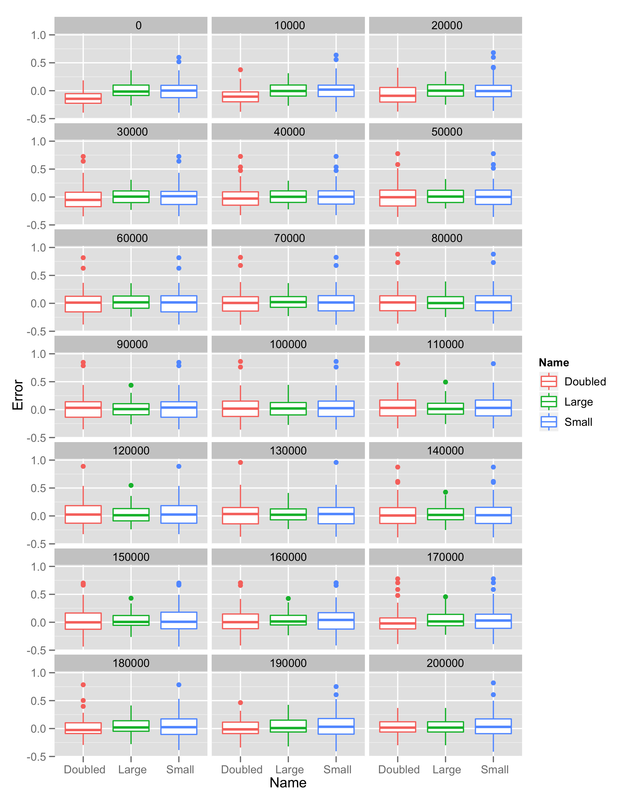 Since PCSA is so sensitive to the least-significant 1 in each bitmap, it would be very interesting to see how different approaches affect the algorithm. For example, in our algorithm we “left” truncated meaning that all bitmaps had to have a one in the least-significant position of the bitmap in order to move up the offset. It would be interesting to look at “right” truncation. If one bitmap is causing many of the others to not record incoming values perhaps it should be bumped up. Is there some math to back up this intuition? It is interesting to us that the fringe width truncation events are DV dependent. We struggled with the math on this for a bit before we just stopped. Essentially we want to know what is the width of the theoretical fringe? It obviously appears to be DV dependent and some sort of coupon collector problem with unequal probabilities. Someone with better math skills than us needs to help here. We uncovered PCSA again as a way to go back to first principles and see if there are lessons to be learned that could be applied to HLL to make it even better. For instance, can all of this work on the fringe be applied to HLL to reduce the number of bits per register while still maintaining the same precision? HLL effectively records the “strandline” (what we call the left-most 1s). More research into how this strandline behaves and if it is possible to improve the storage of it through truncation could reduce the standard HLL register width from 5 bits to 4, a huge savings! Obviously, we uncovered a lot of open questions with this research and we feel there are algorithmic improvements to HLL right around the corner. We have done some preliminary tests and the results so far are intriguing. Stay tuned! Author’s Note: this is just a quick post about an engineering hiccup we ran into while implementing HyperLogLog features that aren’t mentioned in the original paper. We have an introduction to the algorithm and several other posts on the topic if you’re interested. Say you had two HyperLogLog data structures with 5-bit-wide registers, one with and the other with , and wanted to compute their union. You could just follow my colleague Chris’ advice and “fold” the larger one down to the size of the smaller one and then proceed as usual taking the pairwise max of the registers. This turns out to be a more involved process than Chris makes it out to be if you designed your HLL implementation in a particular way. For instance, if you use the 15 least(/most) significant bits of the 64-bit hashed input to determine register index and the next 30 bits to determine the register value, you end up in a tricky situation when you truncate the last 4 bits of the index to get the new 11-bit index. If you imagine feeding the same element into an HLL of the smaller size, then the 4 bits you truncated from the index would have actually been used in the computation of the register value. You couldn’t simply take the original register value you computed, you’d have to take into account the new prefix added to the register value bit string. If the prefix has a 1 in it, you would recompute the run of zeroes on just the prefix (because you know it contains a 1 and thus all the information you need), and if not, you’d add the length of the prefix to the original register value computed. Not a ton of work, but having clutter like this in algorithmic code distracts the reader from the true intention. So how do we avoid this? Well, you could say that it’s very, very unlikely that you’ll ever need more than 30 bits for your register value, so you could assume that the register width would remain constant forever and use the bottom 30 bits for your register value and the next bits for your register index. That way you could just truncate the last 4 bits of the index and know that your register value would still be the same. On the other hand, if you’re Google, that may not be true. In that case, what you should do is use the least (/most) significant bits of your hashed value for the register index and the 30 most (/least) significant bits for the register value. Now you can just truncate the register index and use the original register value. 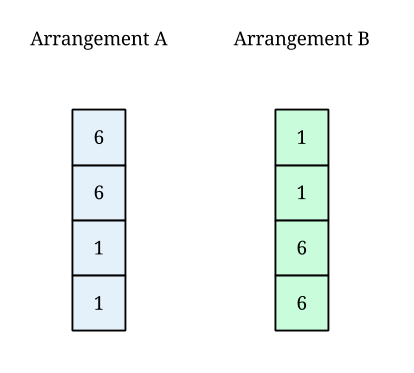 If you’re using a good hash function like MurmurHash3 that gives you 128 bits of entropy, you could simply compute the register index from the first 64-bit word in the hash and compute the register value from the second 64-bit word and completely ignore this problem up to a mind-bending and register width of 6 (aka the heat death of the universe). I know it’s not always possible to anticipate this problem in the early stages of implementing and vetting an algorithm, but hopefully with a bit of research the next time someone looks to implement HLL they’ll see this and learn from our mistake. I’ll take a look at these one at a time and share our experience with similar optimizations we’ve developed for a streaming (low latency, high throughput) environment. I’ll motivate the move to a 64-bit hash function in the context of the original paper a bit more since the Google paper doesn’t really cover it except to note that they wanted to count billions of distinct values. This reduces to a simple probabilistic argument that can be modeled with balls being dropped into bins. Say we have an -bit hash. Each distinct value is a ball and each bin is designated by a value in the hash space. Hence, you “randomly” drop a ball into a bin if the hashed value of the ball corresponds to the hash value attached to the bin. Then, if we get an estimate for the cardinality, that means that (approximately) of our bins have values in them, and so there are empty bins. The number of empty bins should be about , where is the number of balls. Hence . Solving this gives us the formula he recommends using: . The distributions above come from the LogLog paper, on page 611, right before formula 2. Look for . Consider the setting in the paper where . Let’s says we wanted to safely count into the 100 billion range. If we have then our new “large range correction” boundary is roughly one trillion, per the adapted formula above. As you can see from the graph below, even at the large range correction only kicks in at a little under 100 billion! The black line is the cutoff for a 5-bit register, and the points are plotted when the total number of hash bits required reaches 40, 50, and 60. 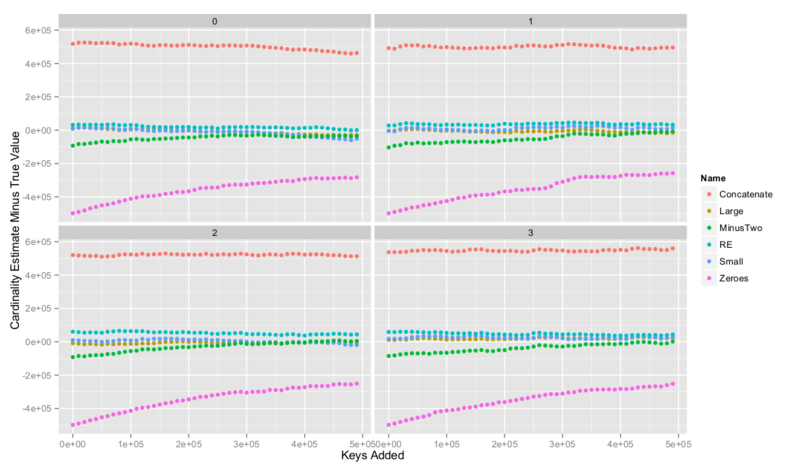 At AK we’ve run a few hundred test runs at 1, 1.5, and 2 billion distinct values under the configuration range and found the relative error to be identical to that of lower cardinalities (in the millions of DVs). There’s really no reason to inflate the storage requirements for large cardinality HLLs by 20% simply because the hash space has expanded. Furthermore, you can do all kinds of simple tricks like storing an offset as metadata (which would only require at most 5 bits) for a whole HLL and storing the register values as the difference from that base offset, in order to make use of a larger hash space. Simply put, the paper introduces a second small range correction between the existing one (linear counting) and the “normal” harmonic mean estimator ( in the original paper) in order to eliminate the “large” jump in relative error around the boundary between the two estimators. They empirically calculate the bias of and create a lookup table for various , for 200 values less than with a correction to the overestimate of . They interpolate between the 200 reference points to determine the correction to apply for any given raw value. 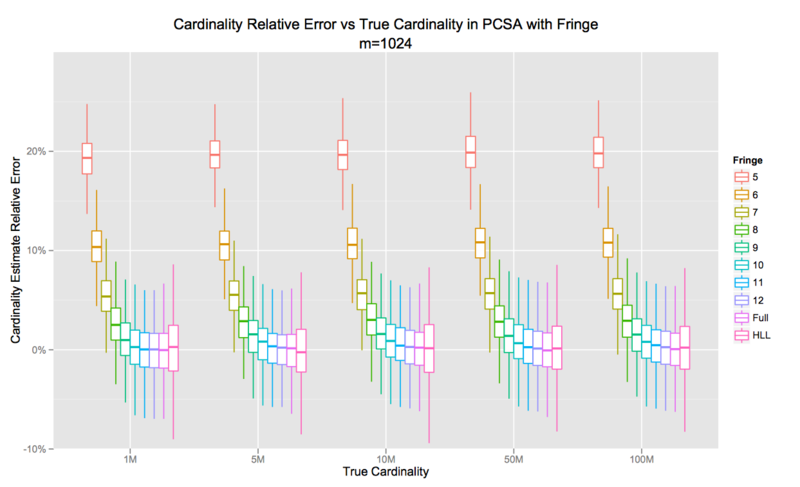 Their plots give compelling evidence that this bias correction makes a difference in the to cardinality range (cuts 95th percentile relative error from about 2% to 1.2%). I’ve been a bit terse about this improvement since sadly it doesn’t help us at AK much because most of our data is Zipfian. Few of our reporting keys live in the narrow cardinality range they are optimizing: they either wallow in the linear counting range or shoot straight up into the normal estimator range. The general theme of this optimization isn’t particularly new (our friends at MetaMarkets mentioned it in this post): for smaller cardinality HLLs there’s no need to materialize all the registers. You can get away with just materializing the set registers in a map. 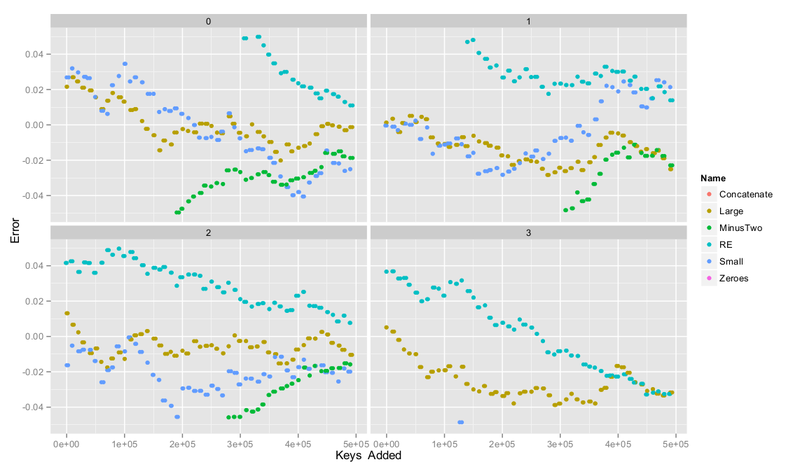 The paper proposes a sorted map (by register index) with a hash map off the side to allow for fast insertions. Once the hash map reaches a certain size, its entries are batch-merged into the sorted list, and once the sorted list reaches the size of the materialized HLL, the whole thing is converted to the fully-materialized representation. Aside: Though the hash map is a clever optimization, you could skip it if you didn’t want the added complexity. We’ve found that the simple sorted list version is extremely fast (hundreds of thousands of inserts per second). Also beware the variability of the the batched sort-and-merge cost every time the hash map repeatedly outgrows its limits and has to be merged into the sorted list. This can add significant latency spikes to a streaming system, whereas a one-by-one insertion sort to a sorted list will be slower but less variable. 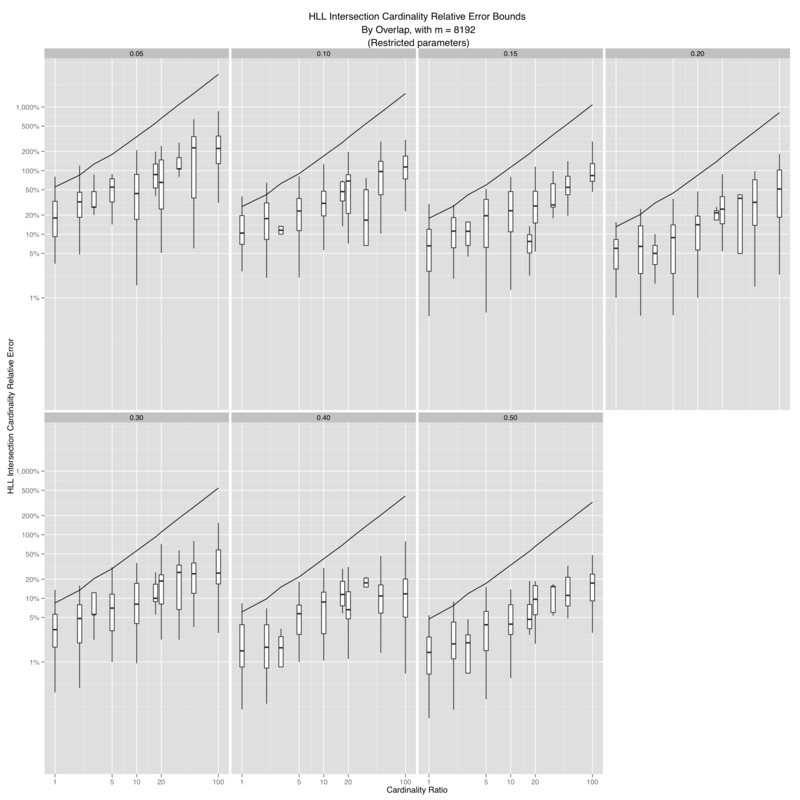 The next bit is very clever: they increase when the HLL is in the sparse representation because of the saved space. Since they’re already storing entries in 32-bit integers, they increase to . (I’ll get to the leftover bit in a second!) This gives them increased precision which they can simply “fold” down when converting from the sparse to fully materialized representation. Even more clever is their trick of not having to always store the full register value as the value of an entry in the map. Instead, if the longer register index encodes enough bits to determine the value, they use the leftover bit I mentioned before to signal as much. The paper also tacks on a difference encoding (which works very well because it’s a sorted list) and a variable length encoding to the sparse representation to further shrink the storage needed, so that the HLL can use the increased register count, , for longer before reverting to the fully materialized representation at . There’s not much to say about it because it seems to work very well, based on their plots, but I’ll note that in no way is that type of encoding suitable for streaming or “real-time” applications. The encode/decode overhead simply takes an already slow (relative to the fully materialized representation) sparse format and adds more CPU overhead. The researchers at Google have done a great job with this paper, meaningfully tackling some hard engineering problems and showing some real cleverness. Most of the optimizations proposed work very well in a database context, where the HLLs are either being used as temporary aggregators or are being stored as read-only data, however some of the optimizations aren’t suitable for streaming/”real-time” work. On a more personal note, it’s very refreshing to see real algorithmic engineering work being published from industry. Rob, Matt, and I just got back from New Orleans and SODA / ALENEX / ANALCO and were hoping to see more work in this area, and Google sure did deliver! Sebastiano Vigna brought up the point that 6-bit registers are necessary for counting above 4 billion in the comments. I addressed it in the original post (see “A solution and a rebuttal“) but I’ll lay out the math in a bit more detail here to show that you can easily count above 4 billion with only 5-bit registers. where is the register value and is the number of (distinct) elements a register has seen. and hence the expected number of registers that would overflow is approximately . So five registers out of sixteen thousand would overflow. I am skeptical that this would meaningfully affect the cardinality computation. In fact, I ran a few tests to verify this and found that the average number of registers with values greater than 31 was 4.5 and the relative error had the same standard deviation as that predicted by the paper, . Effectively, there are no register values outside of . Now I know that I can just store 15 in my offset and the true value minus the offset (which now fits in 5 bits) in the actual registers. The intersection of two streams (of user ids) is a particularly important business need in the advertising industry. For instance, if you want to reach suburban moms but the cost of targeting those women on a particular inventory provider is too high, you might want to know about a cheaper inventory provider whose audience overlaps with the first provider. You may also want to know how heavily your car-purchaser audience overlaps with a certain metro area or a particular income range. These types of operations are critical for understanding where and how well you’re spending your advertising budget. Come up with heuristic bounds around , , and the set cardinalities that could inform our usage of HLL intersections in the AK product. If I have set of integers , I’m going to call the HLL representing it . If I have HLLs and their union , then I’m going to call the intersection cardinality estimate produced . Define the between two sets as . Define the cardinality ratio as a shorthand for the relative cardinality of the two sets. We’ll represent the absolute error of an observation as . That should be enough for those following our recent posts, but for those just jumping in, check out Appendices A and B at the bottom of the post for a more thorough review of the set terminology and error terminology. We fixed 16 values (0.0001, 0.001, 0.01, 0.02, 0.05, 0.1, 0.15, 0.2, 0.3, 0.4, 0.5, 0.6, 0.7, 0.8, 0.9, 1.0) and 12 set cardinalities (100M, 50M, 10M, 5M, 1M, 500K, 100K, 50K, 10K, 5K, 1K, 300) and did 100 runs of each permutation of . 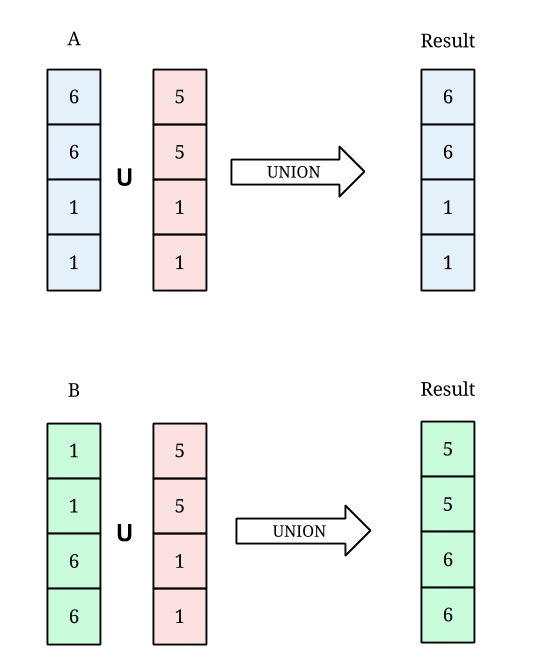 A random stream of 64-bit integers hashed with Murmur3 was used to create the two sets such that they shared exactly elements. We then built the corresponding HLLs and for those sets and calculated the intersection cardinality estimate and computed its relative error. Given that we could only generate and insert about 2M elements/second per core, doing runs with set cardinalities greater than 100M was quickly ruled out for this blog post. However, I can assure you the results hold for much larger sets (up to the multiple billion-element range) as long as you heed the advice below. This first group of plots has a lot going on, so I’ll preface it by saying that it’s just here to give you a general feeling for what’s going on. 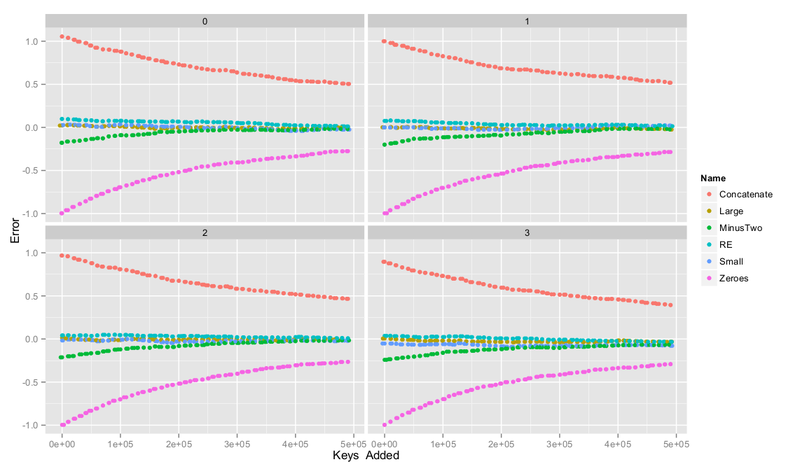 First note that within each group of boxplots increases from left to right (orange to green to pink), and within each plot cardinality ratio increases from left to right. 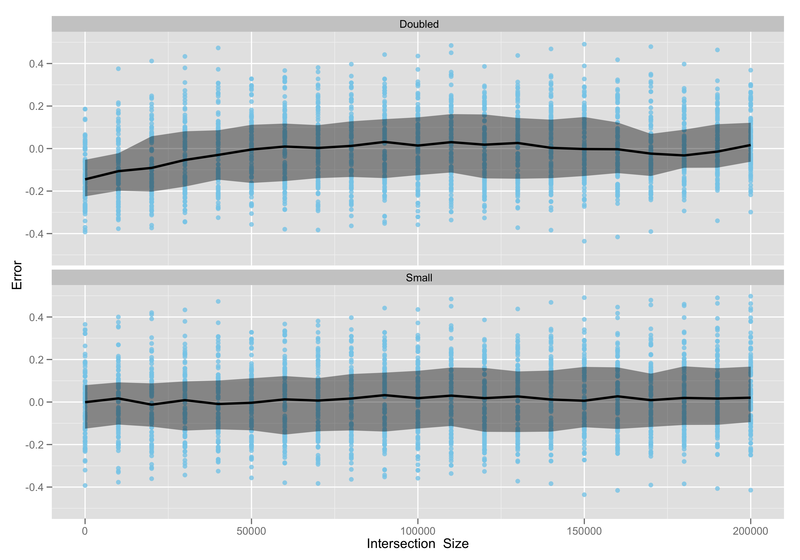 Also note that the y-axis (the relative error of the observation) is log-base-10 scale. You can clearly see that as the set sizes diverge, the error skyrockets for all but the most similar (in both cardinality and composition) sets. I’ve drawn in a horizontal line at 50% relative error to make it easier to see what falls under the “directionally correct” criteria. You can (and should) click for a full-sized image. Note: the error bars narrow as we progress further to the right because there are fewer observations with very large cardinality ratios. This is an artifact of the experimental design. 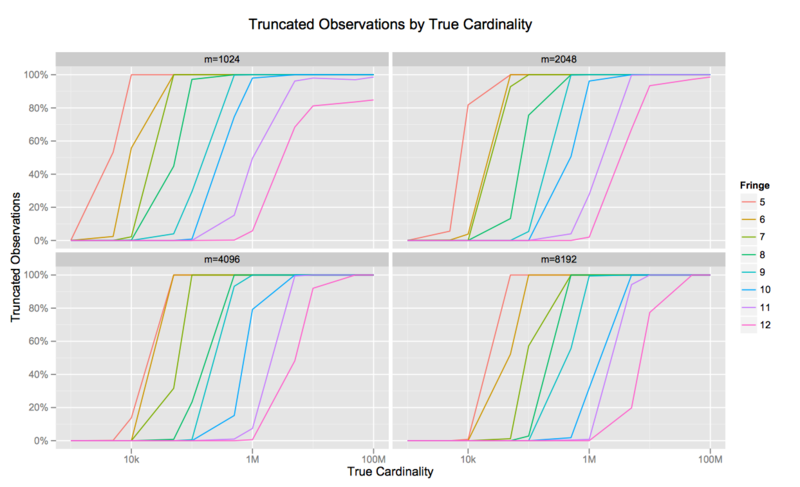 For cardinality ratio > 500, the majority of observations have many thousands of percent error. 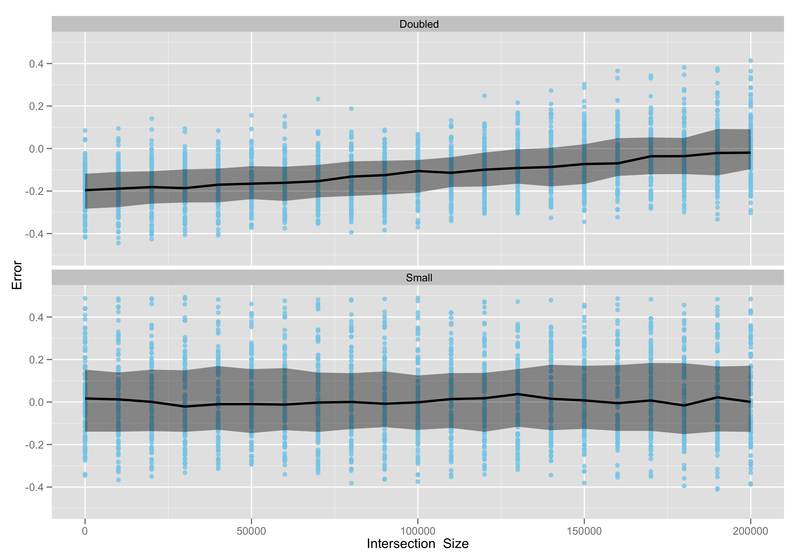 When cardinality ratio is smaller than that and , register count has little effect on error, which stays very low. When , register count has little effect on error, which stays very high. The intuition behind this is very simple: if the error of any one of the terms in your calculation is roughly as large as the true value of the result then you’re not going to estimate that result well. 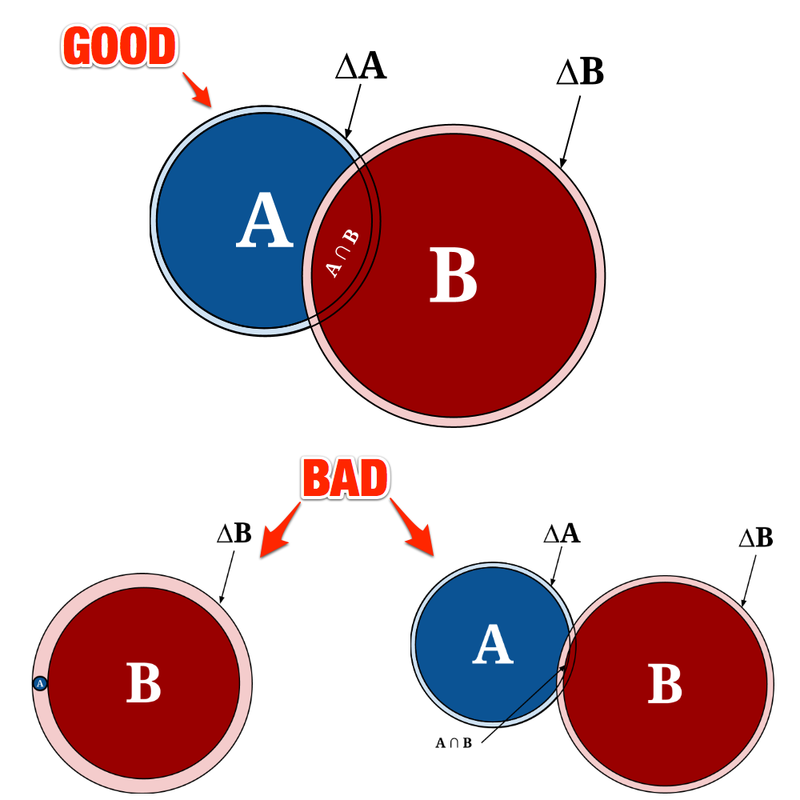 Let’s look back at the intersection cardinality formula. 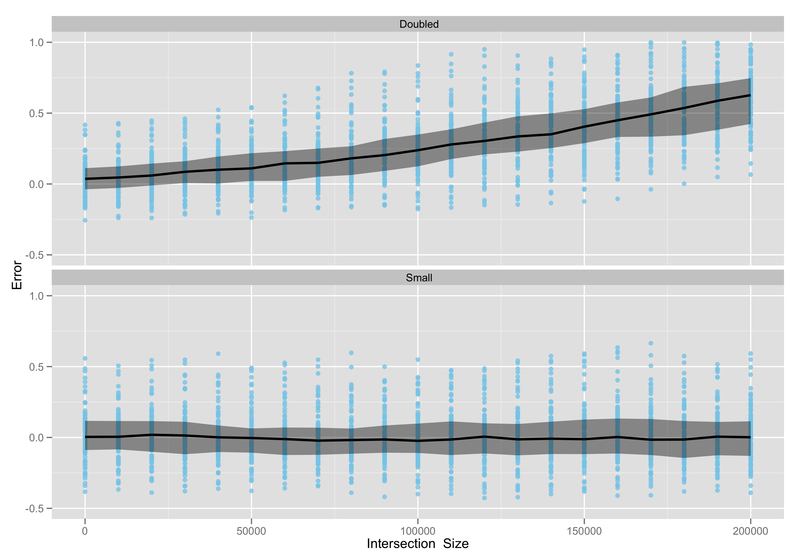 The left-hand side (that we are trying to estimate) is a “small” value, usually. The three terms on the right tend to be “large” (or at least “larger”) values. If any of the “large” terms has error as large as the left-hand side we’re out of luck. 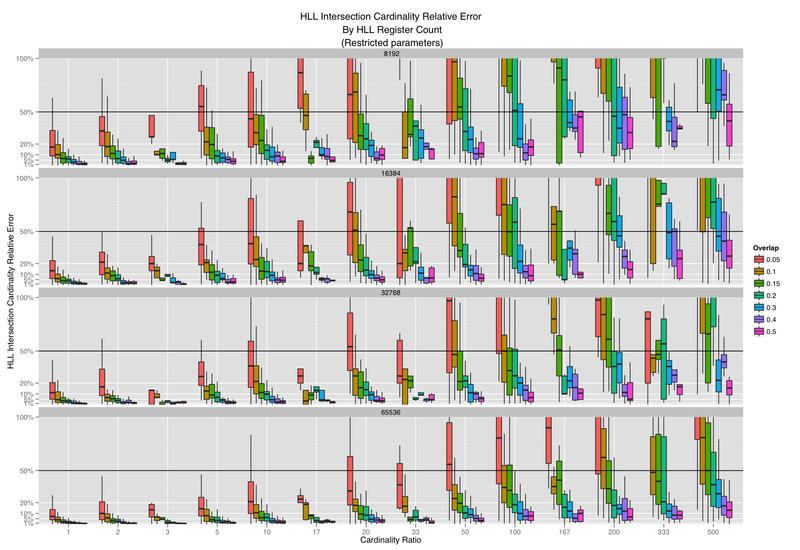 So, let’s say you can compute the cardinality of an HLL with relative error of a few percent. If is two orders of magnitude smaller than , then the error alone of is roughly as large as . In the best scenario, where , the errors of and are both roughly the same size as what you’re trying to measure. Furthermore, even if but the overlap is very small, then will be roughly as large as the error of all three right-hand terms. Let’s throw out the permutations whose error bounds clearly don’t support “directionally correct” answers ( and ) and those that trivially do ( ) so we can focus more closely on the observations that are “on the bubble”. Sadly, these plots exhibit a good deal of variance inherent in their smaller sample size. Ideally we’d have tens of thousands of runs of each combination, but for now this rough sketch will hopefully be useful. (Apologies for the inconsistent colors between the two plots. It’s a real bear to coordinate these things in R.) Again, please click through for a larger, clearer image. By doubling the number of registers, the variance of the relative error falls by about a quarter and moves the median relative error down (closer to zero) by 10-20 points. In general, we’ve seen that the following cutoffs perform pretty well, practically. Note that some of these aren’t reflected too clearly in the plots because of the smaller sample sizes. as in section 4 (“Discussion”) of the HLL paper. Aside: Clearly is not independent of , though is likely independent of . However, I do not know how to a priori calculate the covariance in order to use an error propagation model for dependent variables. If you do, please pipe up in the comments! 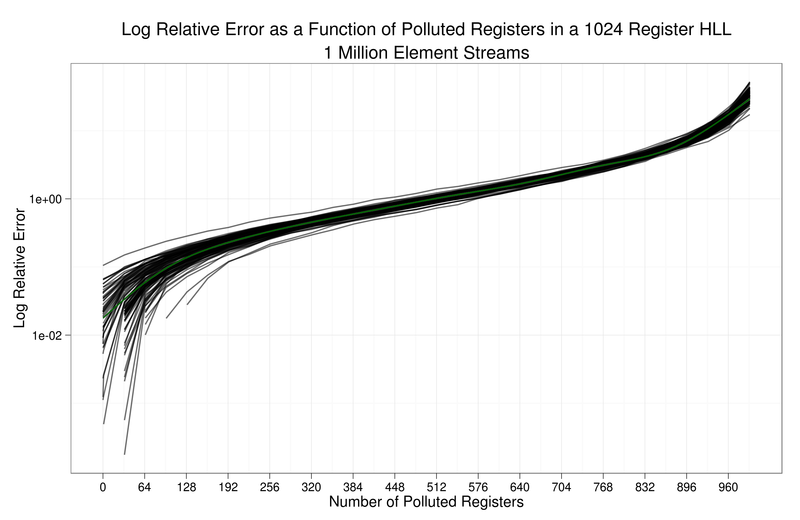 I’ve plotted this error envelope against the relative error of the observations from HLLs with 8192 registers (approximately 5kB data structure). However, it’s really only useful in the ranges shown in the table above. Past those cutoffs the bound becomes too loose and isn’t very useful. This is particularly convenient because you can tune the number of registers you need to allocate based on the most common intersection sizes/overlaps you see in your application. Obviously, I’d recommend everyone run these tests and do this analysis on their business data, and not on some contrived setup for a blog post. We’ve definitely seen that we can get away with far less memory usage than expected to successfully power our features, simply because we tuned and experimented with our most common use cases. We hope to improve the intersection cardinality result by finding alternatives to the inclusion-exclusion formula. We’ve tried a few different approaches, mostly centered around the idea of treating the register collections themselves as sets, and in my next post we’ll dive into those and other failed attempts! Let’s say we have two streams of user ids, and . Take a snapshot of the unique elements in those streams as sets and call them and . In the standard notation, we’ll represent the cardinality, or number of elements, of each set as and . If I wanted to represent the unique elements in both of those sets combined as another set I would be performing the union, which is represented by . If I wanted to represent the unique elements that appear in both and I would be performing the intersection, which is represented by . Example: With as above, . The relationship between the union’s cardinality and the intersection’s cardinality is given by the inclusion-exclusion principle. (We’ll only be looking at the two-set version in this post.) For reference, the two-way inclusion-exclusion formula is . Example: With as above, we see that and . For convenience we’ll define the between two sets as . Similarly, for convenience, we’ll define the cardinality ratio as a shorthand for the relative cardinality of the two sets. The examples and operators shown above are all relevant for exact, true values. However, HLLs do not provide exact answers to the set cardinality question. They offer estimates of the cardinality along with certain error guarantees about those estimates. In order to differentiate between the two, we introduce HLL-specific operators. Consider a set . Call the HLL constructed from this set’s elements . The cardinality estimate given by the HLL algorithm for is . Define the union of two HLLs , which is also the same as the HLL created by taking the pairwise max of ‘s and ‘s registers. The simplest way of understanding the error of an estimate is simply “how far is it from the truth?”. That is, what is the difference in value between the estimate and the exact value, also known as the absolute error. Example: If then the relative error is .